The Pattaya Business & Tourism Association set out to find the most attractive and talented model to represent the city when it hosted the first Miss Pattaya Pageant. PBTA President Sinchai Wattanasartsathorn, Pattaya City Councilman Rattanachai Sutidechanai and Alongkot Sankahapong, managing director of event organizer Star Fighter Ltd. were among the judges for the Sept. 25 pageant at the Zign Hotel. Whittling down finalists from a field of 32 contestants from across the country, the judges judged the women on their modeling skills, beauty, manners and outfits. The goal was to find a winner to be an ambassador for the city. Napatnan Wanduek from Baan Sukawadee took first place, wining 50,000 baht. Phutida Samainiyom won the 30,000-baht second place prize and Lalitha Hongsamad took third and 20,000 baht. Suparat Thai-Ua won fourth and 10,000 baht. Sujanjira Kensap won 5,000 baht for honorable mention. 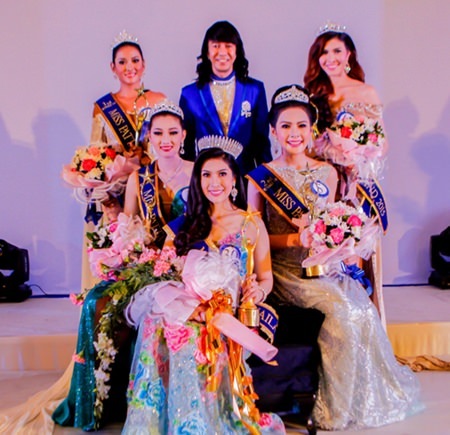 Alongkot Sankahapong (back, center), managing director of the Star Fighter Co., Ltd., poses with Miss Pattaya 2015 Napatnan Wanduek (seated, center), 1st runner up Phutida Samainiyom (seated, left), 2nd runner up Lalitha Hongsamad (seated, right), 3rd runner-up Suparat Thai-Ua (standing left), and 4th runner-up Sujanjira Kensap (standing right). 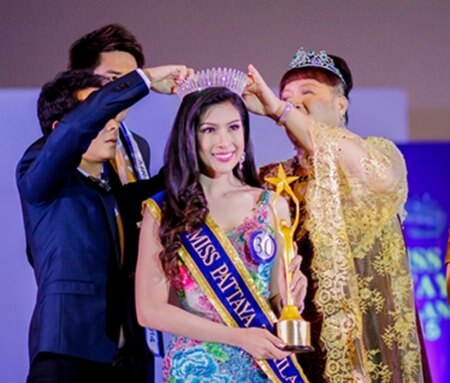 Napatnan Wanduek from Baan Sukawadee is crowned Miss Pattaya 2015. Contestants anxiously wait for their turn to be interviewed.